Acknowledging the hurt and suffering. I dont think I know anyone who hasn’t been through some kind of hurt and suffering in their life. Some people seem to go through it a lot more than others; nevertheless, we have all been there at one point or another in our lives. But if we all had to be honest for a moment, we would all gladly give up our sufferings if it meant we would have an easier life. A long time ago, I realized that suffering was needed in my life because the more I suffer, the more I cling to my faith and God. But even though I needed it, it was hard for me to see the point of it and the purpose of my life. To anyone around me it may seem I may not have much of a life. I am chronically sick and suffering through pain. But what they don’t see when they look at my life is the life bursting through the windows and doors of our home. With seven children, our home is busy with life. There is never a dull moment. To have quiet in our home is unnatural. My life is definitely full, just not in the way society would expect. My home is full of life and faith, love and laughter. Much happens inside our home. At the end of the day, there is nothing better than when we all gather together in the family room to watch some tv together, or read or pray. We thrive as a family always being together in everything we do. But even though as a family we are busy and life giving, deep down I wondered what my purpose in life is. Reading a book about Saint Pope John Paul II, I felt like I was getting to know him personally. When I reached a certain point in the book explaining how as a Pope, he would visit the hospital and ask the patients to pray for him, because even though they are on bed rest and unable to do anything, there is still a purpose in their lives. They can pray. My life has a purpose even when I am too sick to move or do anything. My purpose in life was sealed. But even though I now understood I had a purpose in life and that every life has a purpose, I was still suffering from years of abuse and trauma. I was hurting. I am still hurting. It haunts me. I fight to overcome the hurt and the suffering, but it is always just around the next corner. It hasn’t always been acknowledged what I have been through until the other day, someone said exactly what I needed to hear so I could believe that it wasn’t all in my head. Maybe I could start healing and maybe I will never get an apology, but at least someone said out loud what I needed to hear. The problem is, some of the abuse keeps coming back now and then. Even though my husband is on my side, I still cannot find the courage to stand up for myself completely. Slowly I am learning to say no and place boundaries around me to keep me safe. Then, something occurred to me today. Jesus Christ acknowledged my hurt and suffering the day He died on the cross for us. 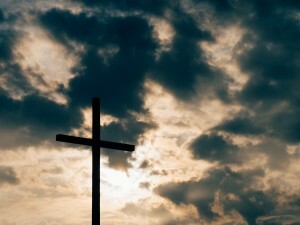 The day He died on the cross for ME! Has anyone else ever done that for me? No. But my Lord Jesus Christ did. He has placed around me boundaries to protect me, by making me a child of our Lord, by blessing me in my baptism, and by giving me the wonderful gifts of the Eucharist. Jesus has saved me from my own sufferings even if I still need to experience them to grow in faith. He has held out His hand for me to take, like he did with Peter on the water.I have grasped that hand and I desperately hold on to it. He will pull me through the sufferings I experience day to day. I may feel like I am drowning, but with Jesus Christ in my life I will never drown. Faith is necessary in order to effectively be a strong body of Christ. Great share.